The Bertha Benz Memorial Route is a German tourist and theme route in Baden-Württemberg and member of the European Route of Industrial Heritage. It opened in 2008 and follows the tracks of the world's first long distance road trip in 1888. Bertha Benz's husband, Karl Benz, patented the first automobile designed to produce its own power in January 1886 (Reichspatent No. 37435). 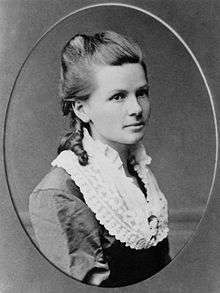 In early August 1888, without her husband's knowledge, Bertha Benz, with her sons Richard (aged 14) and Eugen (aged 15), drove in Benz's newly constructed Patent Motorwagen No. 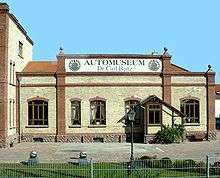 3 automobile, from Mannheim to her own birthplace, Pforzheim, becoming the first person to drive an automobile over more than a very short distance. The distance was about 104 km (65 mi). Distances driven before this historic trip were short, being merely trials with mechanical assistants. Although the ostensible purpose of the trip was to visit her mother, Bertha Benz also had another motive: to show her brilliant husband – who had failed to consider marketing his invention adequately – that the automobile would become a financial success once it was shown to be useful to the general public. On the way, she solved numerous problems. She had to find Ligroin, a solvent available only at dispensing chemists' shops, to use as fuel. Thus the still existing Stadt-Apotheke (Town Pharmacy) in Wiesloch, some kilometres south of Heidelberg, became the world's first filling station. A blacksmith had to help mend a chain in Bruchsal. Brake linings were replaced in Bauschlott/Neulingen north of Pforzheim. And Bertha Benz had to use a long, straight hatpin to clean a fuel pipe which had become blocked, and a garter to insulate a wire. 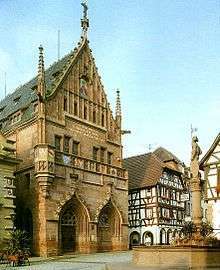 Bertha and her sons left Mannheim around dawn and reached Pforzheim somewhat after dusk, notifying Karl of their successful journey by telegram. They drove back to Mannheim three days later, by a different itinerary. Along the way, several people were frightened by the automobile and the novel trip received a great deal of publicity – as she had sought. The drive was very helpful for Karl Benz, as he was able to introduce several improvements after his wife reported everything that had happened along the way – and she made important suggestions, such as the introduction of an additional gear for climbing hills. In 2007 a not-for-profit initiative, led by Edgar and Frauke Meyer, founded two societies, Bertha Benz Memorial Route e.V. and Bertha Benz Memorial Club e.V., to commemorate Bertha Benz and her historic pioneering deed. On February 25, 2008, the Bertha Benz Memorial Route was officially approved as a Tourist or Scenic Route by the German authorities, a dynamic monument of 194 km of German industrial culture. The authentic route taken by Bertha Benz not only links almost forgotten original sites she passed on her way, it also leads to one of the most attractive scenic regions in Germany, the wine region Baden. 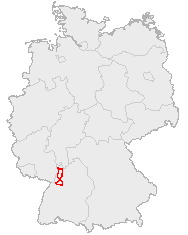 This route of industrial heritage of mankind follows several Roman roads in the area of the Upper Rhine Plain, for example the Bergstrasse (Mountain Road), it leads along the foot of the Odenwald mountains and the Kraichgau, and shortly before reaching Karlsruhe it branches off into the Pfinz valley leading to Pforzheim, the entrance to the Black Forest. As Bertha was afraid of some steep mountains, the return trip follows an alternative route and finally runs beside the river Rhine back to Mannheim. The Bertha Benz Memorial Route opened in September 2008. But the Ministry of State of Baden-Wuerttemberg suggested embedding the official inaugural run in the framework of the ceremony of Automobile Summer 2011, the big official German event and birthday party commemorating the invention of the automobile by Karl Benz. On January 25, 2011 Deutsche Welle (DW-TV) broadcast worldwide in its series Made in Germany a TV documentary on the invention of the automobile by Karl Benz, highlighting the very important role of his wife Bertha Benz. The report was not only on the history of the automobile, but took a look at its future as well, as shown by the Bertha Benz Challenge. Tesla Roadsters at the Bertha Benz Challenge 2011 in Mannheim. The first Bertha Benz Challenge took place on September 10 and 11, 2011. In the future it will take place yearly, aiming to become a globally visible signal for a new automobile breakthrough, as it is only open for sustainable mobility: Future-oriented vehicles with alternative drive systems – hybrid and electric vehicles, hydrogen and fuel cells – and other extremely economical vehicles. Its motto is: Sustainable Mobility on the World’s Oldest Automobile Road! The second Bertha Benz Challenge took place from September 14 to 16, 2012, but started from the Automechanika held by the Frankfurt Trade Fair. It also included two rounds on the motodrom of the Hockenheimring, that thus opened itself towards sustainable future mobility. The third Bertha Benz Challenge took place from September 13 to 15, 2013, starting for the first time from the Frankfurt Motor Show, one of the world's largest motor shows, and supported by the presence of the German Environment Minister, Peter Altmaier along with Winfried Kretschmann and Volker Bouffier, the Prime Ministers respectively of Baden-Württemberg and Hesse. ↑ (Karl Volk:) Carl Benz. Lebensfahrt eines Erfinders. Koehler & Amelang 1925, unchanged reprint München 2001, ISBN 3-7338-0302-7. (Onlineversion), chapter "Die ersten Fahrten: Im Fabrikhofe & Auf der Straße"
↑ Winfried A. Seidel: Carl Benz. Eine badische Geschichte. Edition Diesbach, Weinheim 2005, ISBN 3-936468-29-X, page 38: Article in the "Badische Landeszeitung", June 4, 1886, and in the "Generalanzeiger", Sept 5, 1886. ↑ (Karl Volk:) Carl Benz. Lebensfahrt eines Erfinders. Koehler & Amelang 1925, unchanged reprint München 2001, ISBN 3-7338-0302-7. (Onlineversion), chapter: "Wir fahren in die Welt! Die erste Fernfahrt". ↑ The 1st Gas Station Archived July 19, 2011, at the Wayback Machine. ↑ http://www.neulingen.de/index.cfm?fuseaction=neulingen&rubrik=historisches&id=26 The leather was nailed onto the brake blocks by the shoemaker Karl Britsch in front of the guesthouse "Adler" (Eagle). (Karl Volk:) Carl Benz. Lebensfahrt eines Erfinders. Koehler & Amelang 1925, unveränderte Neuauflage München 2001, ISBN 3-7338-0302-7. (Onlineversion), chapter: "Der neue Wagen holt sich auf der Münchener Ausstellung 1888 die Große Goldene Medaille". ↑ (Karl Volk:) Carl Benz. Lebensfahrt eines Erfinders. Koehler & Amelang 1925, unchanged reprint München 2001, ISBN 3-7338-0302-7. (Onlineversion), at the end of the chapter: "Wir fahren in die Welt! Die erste Fernfahrt". ↑ http://www.neulingen.de/index.cfm?fuseaction=neulingen&rubrik=historisches&id=26 For the return trip she preferred the smoother road via Bauschlott. Wikivoyage has a travel guide for Bertha Benz Memorial Route.